A beef sirloin steak comes from close to the cow's rump. Because it's taken from a fairly well-used muscle, sirloin is not particularly tender. The best bet to tenderize it is to start with quality meat, marinate it and cook it only to medium rare. Steak quickly dries out and becomes tougher when it reaches medium. For maximum control and accessibility to the steak during cooking, it's best to pan sear it rather than put it in the oven, broiler or leaving it on the grill. Marinate the steak with a recipe of choice. Help break down the meat's tough muscle fibers by using a marinade that contains an acid, such as lemon juice. Barbecue sauces or tomato sauces are alternatives to marinade. Pour the marinade in a glass baking dish, lay the beef in it and cover the dish with plastic wrap. Soak the sirloin steak in the marinade for six to 12 hours in a refrigerator. Turn it over halfway through the marination time. Take the sirloin steak out of the marinade 30 minutes before cooking it. Let the excess marinade drip off, then pat the steak dry with clean paper towels. Leave the steak out of the refrigerator so it can reach room temperature. Chilled beef toughens when it hits a hot pan. Discard the marinade, or, if you intend to use it on the cooked steak, bring it to a full boil first to kill bacteria from the raw beef. Add any desired seasoning to the sirloin. Refrain from salting the beef until after cooking, though. Salt draws the meat's moisture to the surface during cooking, yielding a less tender steak. Trim any significant layer of fat off the edges of the sirloin steak. Be careful, however, not to nick the meat; the juices inside the beef that help keep it tender bleed out of cuts during cooking. Use a small, quality, non-serrated knife for precision cuts. Melt 1 tbsp. of unsalted butter into 1 tbsp. of cooking oil as it preheats in a large skillet over high heat. Wait until the pan begins to smoke. Reduce the burner's heat to medium. Put the sirloin steak face down into the hot skillet. Sear the sirloin steak for four minutes. Shake the pan by the handle periodically a few times during this time to prevent the steak from sticking. Turn the sirloin over with tongs or a spatula. Do not impale it with a fork or knife to turn it, for the same reason you take care not to cut into the meat during trimming. Continue cooking the sirloin steak for about another five minutes, until a meat thermometer indicates it has reached 125 degrees Fahrenheit at the center. Cooking time varies depending on the thickness of the sirloin and other factors. Transfer it from the skillet to a plate immediately to prevent overcooking. 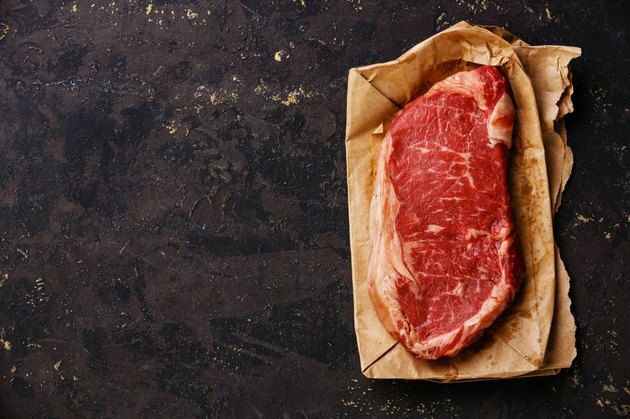 If you prefer the beef rare, remove it at 115 degrees Fahrenheit, or if you prefer it medium, remove it at 135 degrees Fahrenheit. Cover the plate with aluminum foil and let the sirloin rest for 10 minutes. During this time, its temperature rises about 5 degrees and the internal juices redistribute and settle. Do not cut the beef before resting, or its juices run out, making the meat less tender.